Webcam "Weather Webcam Lignano Sabbiadoro (Adria)"
In Lignano Sabbiadoro, there is the Webcam Weather Lignano Sabbiadoro (Adria). Enjoy the slideshow of this weather webcam. 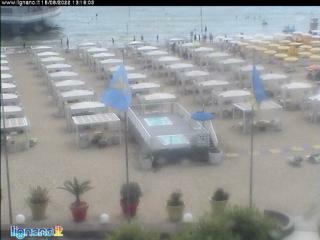 The webcam Lignano Sabbiadoro is regularly updated with new pictures. Track the current weather in Lignano Sabbiadoro Adria with the webcam LIGNANO SABBIADORO. Lignano Sabbiadoro is the center of the peninsula and consists of numerous hotels, bars, shops and apartments. A central shopping area, which is mainly met in the summer with life, resulting from Viale Centrale on the newly built pedestrian zone up to the Terrazza al Mare at the tip of the peninsula. The beach in Sabbiadoro is divided into several sections, which have a different screen color. Lignano Pineta is a bit quieter in the middle of the three parts of the city and was developed in the 1950s. Pineta is located in a pine forest, where hotels, apartments and houses are located. The only shopping street located in the center Pineta. It leads from the church to the sea and has shops and cafes on. Lignano Riviera lies at the mouth of the Tagliamento and is still quieter than Pineta. In Riviera there are few hotels, but several campsites, a golf course and a marina on the Tagliamento. The current live Weather for Lignano Sabbiadoro is provided by netatmo.